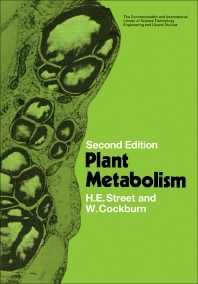 Plant Metabolism, Second Edition focuses on the processes, principles, and methodologies involved in the metabolism of higher plants. The book first elaborates on cell structure and function, enzymes, and catabolism. Discussions focus on the control of respiration, conservation of the energy liberated in respiration, chemical pathways of respiration, enzymes in the living cell, prosthetic groups and coenzymes, protein nature of enzymes, general structure of plant cells, and osmotic behavior of cells. The manuscript then tackles anabolism and secondary plant products. Topics include phenylpropanoids, flavonoids, isoprenoid compounds, assimilation of nitrogen and sulfur, synthesis of sucrose and polysaccharides, location of the photosynthetic apparatus, influence of external factors on the rate of photosynthesis, and general nature of photosynthesis. The text takes a look at growth and differentiation, absorption, secretion, and translocation, secondary plant products, and regulation of metabolism. The publication is a valuable source of data for plant science experts and researchers interested in plant metabolism.